It happens with me a lot of times that when burning a Music CD for my car a lot my favorite songs are left out. It is simply because my car CD player normally accepts Mp3 files but with only 700 mb of space is available on a music CD. It is very difficult to drive and change CDs at the same time in order to listen to a specific song which is in another CD that could have been on the same CD as well, if and only of there was a little bit more space available on it. Well that is my version of the problem but I am sure that most of us who store music on their computers would want to somehow shrink the size of their collection without having to compromise with the quality and there would also be people who would want to improve the quality of the music they have just to increase the pleasure they get while listening to it. How can you do it ? Well We might just have the exact thing for you. 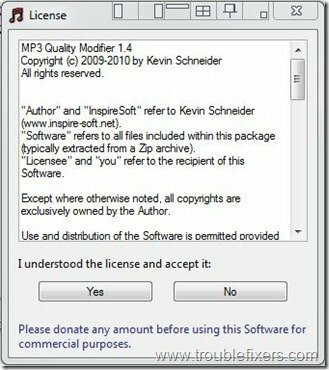 With this Free Mp3 Quality modifier you have a plenty of options to choose from in order to modify your Mp3 files. 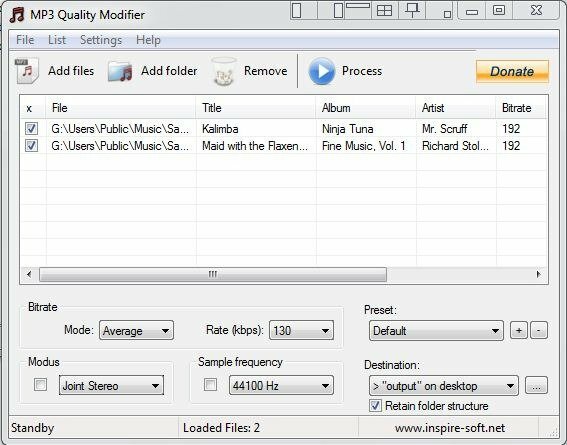 With this Mp3 modifier you will be able to change the quality of your mp3 files according to your own needs simply and easily.There is no need to install this program and you just have to run the exe file after downloading which does not add up as a burden to your computers performance. First you will be prompted to accept the user license agreement and after accepting it you will be shown the help page to get started. This is a very informative part and reading this might help you out with how to use this software in case you are a newbie to these kind of software . 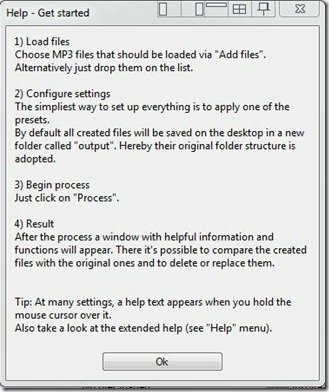 It will tell you how to load the file , how to configure the setting and the following steps which would take place while working of the software. Next will be the tab in which you will drag and drop the files you want to modify. 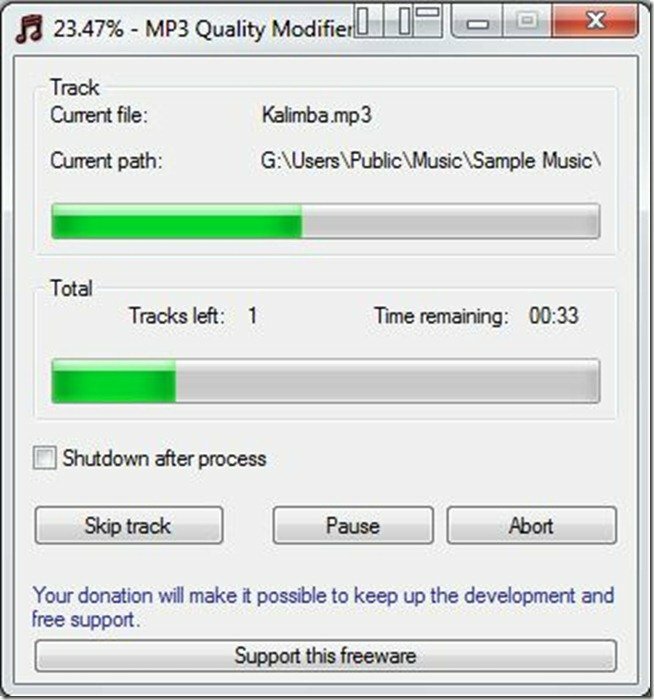 This is the most important part of all , and in this part you will be able to change the Bitrate Mode to Constant / Average / Variable and Rate varying form 10 to 310 Kbps . You can also change the Modus to Mono / Joint Stereo / Stereo / Dual Channels and Sample Frequency from 8000 Hz to 48000Hz. 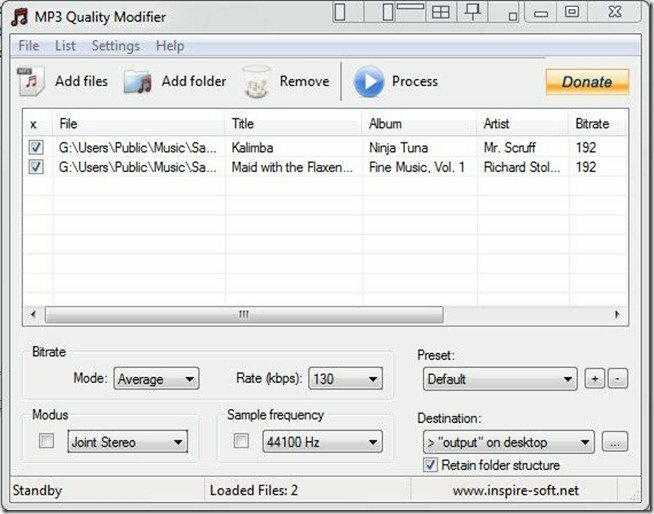 The most simple way to select the music mode is to select a already given preset from default / High Quality / Portable / Compromise / Low Level. All the other given options will automatically change when you select a preset so you will be able to see what will be the specifications of the output file even before running the program. After starting the application the next window will show you the progress of the file being modified. You can also skip the current file in case you want to go to the next file directly. 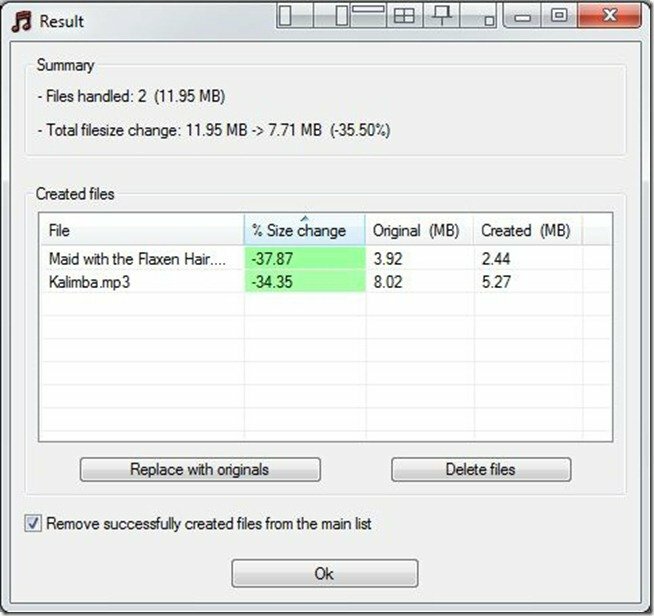 With the next window you will be able to see the comparison between the older files and the new ones. 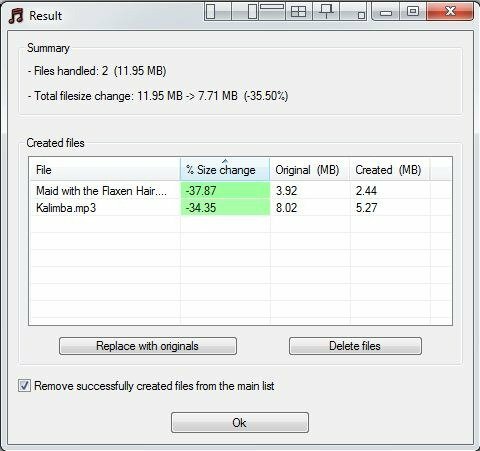 Here you will be able to see the total file size change and also separately the percentage in size change, original size and the created size in MB. 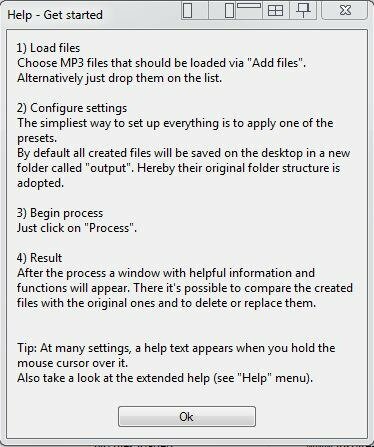 You can then opt to replace the file with the originals or just delete the files. If you want you can keep the history of the files or remove the successfully created files from the main list. 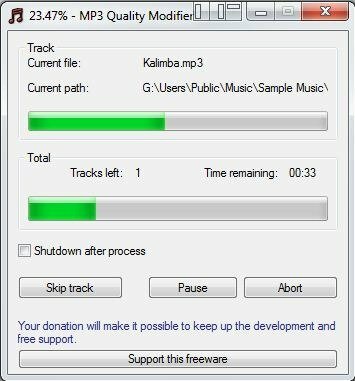 In the end we would say that this free tool can be very useful who want to modify their Mp3 files according to their needs. Previous articleHow to Run a Test Page on Hewlett Packard? Nice Blog and it is really very knowledgeable…keep posting blog like that. If you want any Mobile app related to music and good quality sound then get in touch with best mobile app development company.